I’m officially hooked on the presidential election. And as a science enthusiast, I rank scientific policy as a major issue in deciding which candidate to support. Unfortunately, I rarely hear about the candidates’ views on science, medicine and the environment. There is an easy solution to this lack of scientific discussion: a presidential debate dedicated exclusively to science. I wish I could take credit for the idea, but a group of scientists, journalists, university presidents, and business and government leaders are already pushing for Science Debate 2008 on April 18 in Philadelphia. While I have my doubts that it will actually happen, I really hope this debate comes to fruition. The next president will make decisions on a slate of hot-button scientific issues, and those decisions will have a huge impact on the country’s future. Take climate change and the shift to alternative fuel sources. Just last week, two studies came out asserting that biofuels actually lead to more greenhouse gas emissions than conventional fuel sources. I’d like to hear the candidates answer questions on how to reduce the country’s dependence on fossil fuels. Do they favor ethanol and other biofuels? Solar/wind power? Fuel cells? How about nuclear power? There are so many other topics that could be discussed in such a debate: embryonic stem cell research, funding for the space program and the ethics of synthetic biology, just to name a few. Combating recession and the war in Iraq are important issues, but the absence of science-related questions in prior debates is disheartening. In the much-publicized CNN debate between Democrats Hillary Clinton and Barack Obama on Jan. 31, not a single one was asked (unless you want to count healthcare reform). The term “global warming” came up a grand total of one time. Scientific policy warrants the American people’s attention. Let’s at least get the presidential candidates to discuss it in one debate. On a side note, it is amazing to see how far technology has come in eight years. 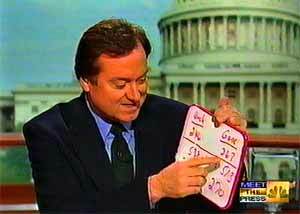 In 2000, I was laughing as NBC’s Tim Russert analyzed the Electoral College with a marker on a whiteboard. Now I’m watching CNN’s John King zoom in for a county-by-county voting breakdown on a giant LCD screen.